We fear it. We hear horror stories about it. Hell is the place nobody wants to go to. Can such a scary place really exist? It is popular today to question how a loving God could ever send somebody to a place of torment… especially forever. Critics say that religious leaders use the concept of hell to scare people so they can control them and their wallets. Others question if Hell is real, is it forever? Others believe Hell is a place where the last ounce of energy to resist God is expended and people finally succumb to God’s love…which never fails; this is called “Hopeful Inclusivism”. Some say hell is a place of annihilation (the end of existence). Articles like “Why Hell Is Not in the Bible” helps us understand why some scholars don’t believe in a literal eternal hell. Explaining all the different doctrines about hell can leave one lost in a theological abyss. Explaining it Biblically is much easier. Regardless of its duration or dimensions, it is not a place any sane person wants to go to. The scholars who believe in a traditional hell believe God knows how to faithfully judge and determine the fate of all those who have never heard the Gospel? He determines their fate by their conscience amidst the knowledge they do have? He decides what to do with aborted babies and children before the age of accountability by His foreknowledge (or Middle Knowledge; a Molinist View) by how they would have lived (see Romans 2:14-16, 26-27). It is interesting to note that the same Greek word used for eternal or everlasting life is used to describe eternal or everlasting fire or damnation. 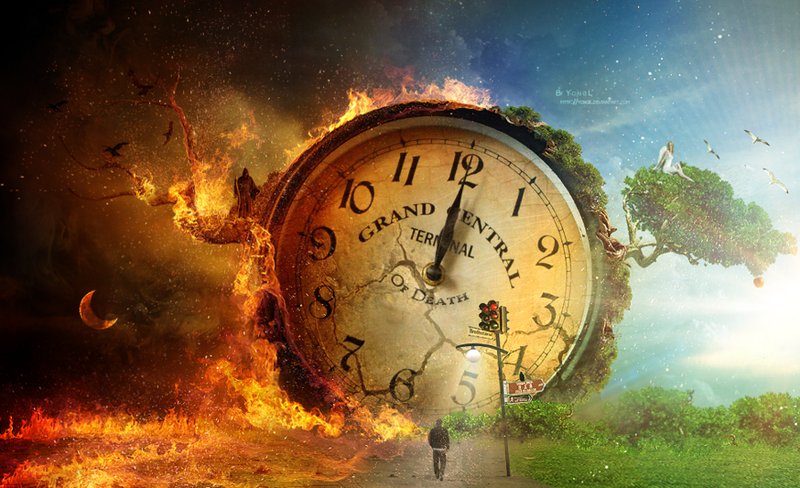 I guess if we are questioning if damnation is forever we may need to rethink if our salvation is forever as well. In any event, we sometimes forget that the Good News Jesus told us to proclaim to the world is good news because the bad news is so bad. Jesus came to save us from Gehenna; the smoldering “garbage dump” of His day. Many believe this represents the spiritual garbage heap in the afterlife. Some say that God allowed humans to kill Jesus on the cross was for the purpose of revealing how bad the depravity and cruelty of sinful man is. Others see it as God’s way of describing how terrible hell must be must be by how much Jesus was willing to endure to save us from it. This innocent God-man suffered so much because He wanted to save us from something so terrible and so horrific, it is beyond words. Perhaps that’s why Jesus warned us so much about a place called hell. Some say these Scriptures metaphorically refer to the consequences of sin in this life. Yet it makes one wonder, why does some concept of Hell exist in almost every culture on earth? It maybe because we humans somehow instinctively expect there must be some accounting, some reckoning for acts of evil if there truly is a just God-afterlife. There must be a heavenly Judge Who cannot be bribed or manipulated, Who will bring righteous judgment to all the evils in the world. One thing is for sure…God will not put anyone in a “headlock” and force them into heaven. So what is so beautiful about Hell? Have the scholars who believe in a traditional hell found any meaningful reasons why a loving God would allow for a place like this? Here are three possible things to consider. 1 – Could Hell Reveal How Loving, Wise and Merciful God Is? I know that may sound strange; but think about it for a moment. If God truly gave us a free-will to choose to love and serve Him or reject Him, there also would have to be a real place to go for those who would refuse Him. It would be cruel and merciless to force someone into heaven if they didn’t want to be there. If they didn’t love God, love His people, love His ways or love intimate communion with the Creator, why should they be forced to live in heaven? It would also be unfair to the multitudes who wanted to be with God. Why should they be subjected to an “eternity with angry house guests” who are hostile to God and His ways; that wouldn’t be paradise to them either? That’s how we can be in heaven and be cool with people in hell; even our loved ones. When you realize that they are rejecting the Creator and Author of life, separation from them is not only required but welcomed (see Luke 14:26). Jesus said, compared to our love for Him our affection for others would look like hate. I know before I became a believer, hanging around Christians, Bible reading, a worship service, a prayer meeting or mission work would be hell for me. I wanted to be as far away as possible from God’s light and His life. As a former law-breaker I always avoided the cops. As a sinner, I did the same thing with God. However now that I’ve been born again those things are like air in my lungs…the very things that gives me joy and purpose for living. I can’t get enough of His glorious presence. The loving thing for God to do for those who love God and those who don’t is to make a place for each of them. Our time here on earth, provides us with a complete vetting process and clarifies our choice before a just God. 2 – Could The Fact that a Place Without God Being so Terrible Mean that God’s Presence is so Awesome? Some may ask; “Why does Hell have to be such an awful place?” First of all we need to realize that wherever God’s presence is absent, there you will find Hell! The heroin addict, the pimp, the prostitute, the gangster, the corrupt businessman, the hate-filled terrorist, the cold–hearted homemaker all experience this emptiness whether they will admit it or not. People often overlook the fact that God is the Author of life, liberty, glorious light, health, wonder, beauty, boundless love, mercy, acceptance, unending joy, unspeakable peace and goodness. If you don’t want to be around Almighty God, you’ll be separating yourself from these attributes and benefits as well. But why would God make it a place of gruesome fire? Scholars differ as to the reasons. As we said before, it may not be any of God’s doing. It may simply be just an unavoidable by-product of God’s absence and so many godless people in one place. However some scholars believe the fires of Hell could actually be a result of God’s mercy at work. The very flames themselves could be God’s way of crippling or restraining the ability of the stronger and more-wicked rebels from inflicting greater torment on others. For example, if you were put in jail for DUI you would probably appreciate the insane ax-murderer in the cell with you being securely handcuffed to the opposite wall so they wouldn’t be able to hurt you. The flames of Hell and the Lake of Fire may be there to keep them from tormenting each other. Some believe that those in Hell will suffer proportionally to the level of sin and rebellion they lived on earth. Likewise those in heaven will be rewarded according to their works on earth. Jesus indicated these differences when He said, it would be more tolerable in the day of judgment for those in Sodom and Gomorrah than those cities in Israel who rejected the Gospel. The more knowledge one has the greater the condemnation. 3 – Could Hell be a Place You Have to Actually Fight to Get Into? That’s right. Nobody gets into Hell unless they want to be there. You have to battle your way into this place. You have to fight past every obstacle God puts in your path. You have to fight to ignore the hundreds if not thousands of signs and indicators from creation revealing the goodness and glory of God (Romans 1). You have fight to ignore Christians witnessing to you. You have to refuse the Good News coming from the ministers on TV, radio, newspapers, your friends, relatives and the guy at work. You have to ignore scenes in movies that depict God’s invitation to be saved. You have to ignore this article. You have to fight the voice of your conscience. You have to fight the still small voice of the Holy Spirit convicting you of refusing the God Who created you. Yes, you have to fight and resist with every ounce of energy you have until your last breath to get into Hell. 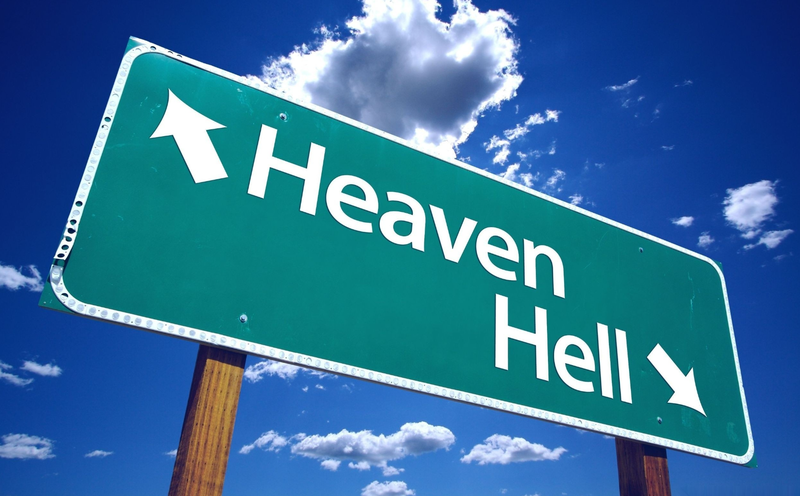 C. S. Lewis suggested that there is a way for people in hell to leave but they inevitably always end up choosing to stay there because separation from God is worth more to them than the suffering it causes. In any event, regardless how you define Hell, it was never intended for mankind; it was prepared for the devil and his crew (Matthew 25). If you don’t want to go to a place like that, ask Jesus Christ to come into your life and save you from your sins and their consequences… surrender all you are to Him…Let Him be your Lord. You will truly see why the Good News is so good! Posted in Most Popular Articles and tagged Choice, Eternal Security, Heaven, Hell, Jeffrey B Krall, Jesus, Judgment, Salvation, Universalism on December 29, 2013 by Jeff Krall.